Liberal billionaire George Soros is the only person funding a new super PAC aimed at getting Latinos out to the polls to vote for Democrats in 2016, recent Federal Election Commission filings show. The Immigrant Voters Win PAC was launched last month as part of a campaign, called "Families Fight Back," organized by immigration activist groups opposed to the Republicans running for president. The super PAC received a $3 million check from Soros on March 11, 2016—the only donation the group has received to this point. The group’s goal is to register 400,000 new Hispanic voters before the November elections. Soros said at the beginning of March that the "anti-immigrant" and "anti-Muslim" rhetoric in the Republican primary should come with consequences. "The intense anti-immigrant and anti-Muslim rhetoric that has been fueled by the Republican primary is deeply offensive," Soros told the Hill. "It is harmful to our democracy and our national interests. There should be consequences for the outrageous statements and proposals that we’ve regularly heard." The Latino Victory Project, another group involved in the campaign, was co-founded by actress Eva Longoria and San Antonio-based entrepreneur Henry R. Muñoz III, who has worked as the chair of the DNC’s national finance committee since 2013. Muñoz came under fire last year for helping raise money for Hillary Clinton’s campaign despite rules saying officers must remain neutral in presidential primaries, Politico reported. Longoria was an early supporter of Clinton and provided a $2,700 contribution to her campaign in May 2015. The super PAC is not the first project that Longoria and Muñoz have worked on together. The duo also ran the Futuro Fund, a former arm of President Obama’s reelection campaign, which pulled in $32 million for Obama’s campaign in 2012. The Latino Victory Project has not disclosed any contributions, and expenditures by the group only appear in 2014, according to data compiled by the Center for Responsive Politics. The group put $179,600 toward media and $147,100 toward salaries in 2014. Waterfront Strategies, a political consulting group located in Washington, D.C.’s Georgetown area, received $179,575 from the Latino Victory Project, the largest amount the group dispersed that year. Waterfront is an internal branch of GMMB Strategies, a major media consultancy firm that made President Obama’s ads during his reelection campaign and represents a number of high-profile Democratic politicians. The group was the highest-grossing political vendor in 2012, recording payments of $435 million. That same year, Waterfront made an additional $96 million worth of payments on behalf of Democratic super PACs. One partner at the group, Jim Margolis, is a former top consultant to President Obama and is now a senior adviser to Hillary Clinton. Deepak Bhargava—the executive director of the Center for Community Change, another organization involved in the launch of the Immigrant Voters Win PAC—sits on the advisory board of Soros’s Open Society Foundation. The Center for Community Change has received more than $2.9 million in funding since 2010 from the Advocacy Fund, a liberal lobbying shop associated with the Tides Foundation, a donor-advised fund that has received millions from Soros. America’s Voice, the third group in the coalition, carries a stated mission of fighting for "[a] direct, fair and inclusive road to citizenship for immigrants in the U.S. without papers" and for "channels for future legal immigration that are flexible and functional." America’s Voice received funding from the Advocacy Fund in the amount of $450,000. America’s Voice gave a $75,000 grant to the Campaign for Community Change in 2013. 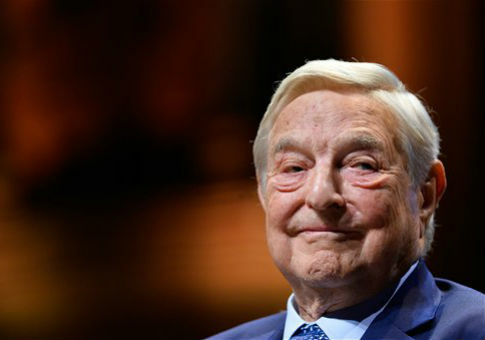 In addition to funding the Families Fight Back campaign, Soros is also fueling the campaign challenging voter identification laws in numerous states with the help of Marc Elias, an attorney at the Washington, D.C.-based Perkins Coie law firm. Elias is Hillary Clinton’s top campaign lawyer, although he is working independently of the campaign on the voter ID law challenges and in his capacity as a partner at Perkins Coie. None of the groups involved with the Families Fight Back campaign returned a request for comment. This entry was posted in Issues and tagged Campaign Finance, George Soros, Immigration, Super PACs. Bookmark the permalink.